It's 1910, and I could use some new clothes. I'm all grown-up now, well into my twenties, and some nice clothes could probably help me find a better job, and a girlfriend. Let's face it, I'm a mess. Let's take a look in the paper. 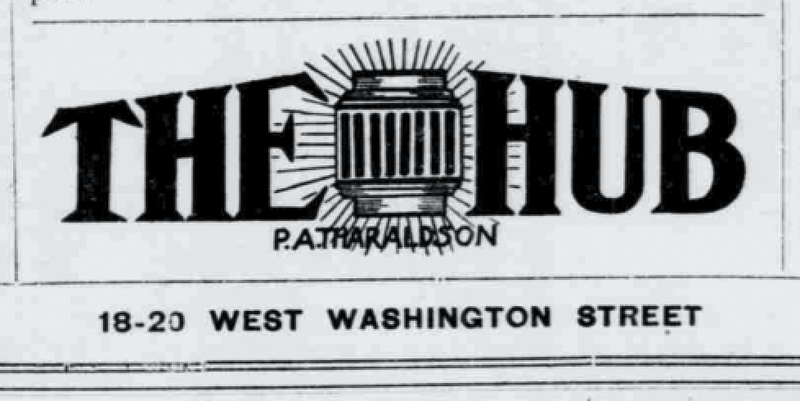 There's a place called "the Hub" on Washington Street. Let's see, the address is 18-20 W. Washington so it must be a pretty big place. 18 W. Washington is west of Central and on the north side of the street. But before we go, I think I'll read this ad more carefully. I don't have much money, but I want to look sharp, and have good quality clothes. 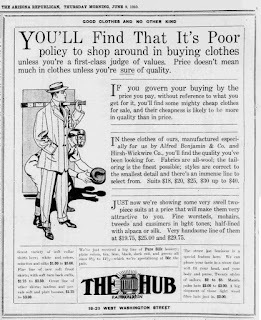 OK, let's see... the ad says that it's poor policy to shop around buying clothes unless you're a first-class judge of values. Well, I haven't a clue, so that sounds like me. I see that their slogan is "good clothes and no other kind" - not very catchy, but I understand it. 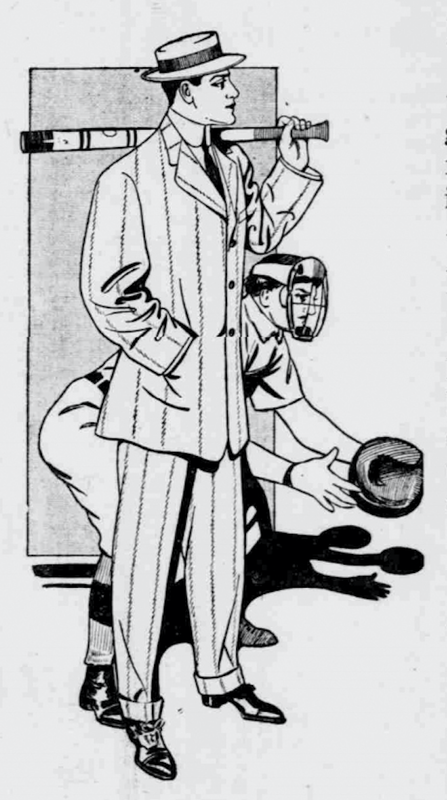 What I don't understand is why that baseball player is wearing a suit? I wonder if that's what the baseball players back east are wearing? And apparently the strike zone is different. 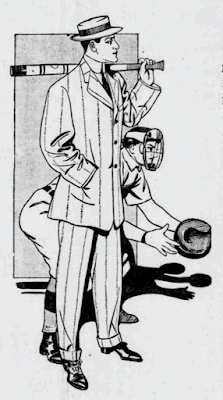 Anyway, the guy in the drawing looks like me, so I should probably get a suit like that, and a hat like that, too. Wow! 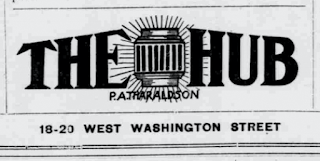 I can't believe that the newspaper was allowed to use the word "swell"! I guess it's not as bad a word as it used to be. I remember my mom washing my mouth out with soap when I used it when I was a kid! Times change! It looks like I can get worsteds, mohairs, tweeds and cassimers in light tones: half-lined with alpaca or silk. I have no idea what any of that means, but it looks like there's a very handsome line of them at $19.75. I'll break open my piggy bank and go shopping! Thank you for going to the Hub with me! 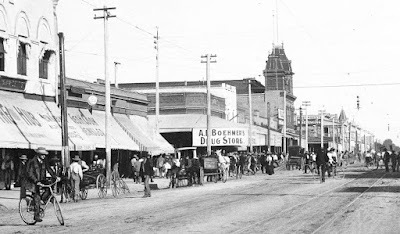 The Hub in 1903 (on the left). 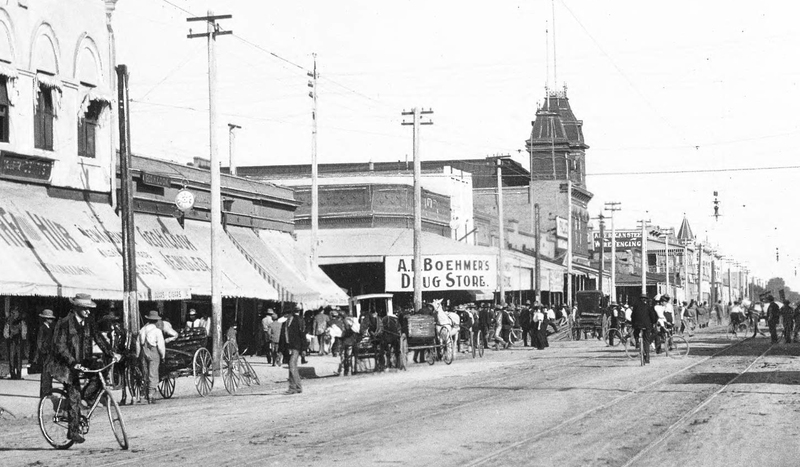 You're looking east on Washington towards Central, Phoenix, Arizona.